The air horn is a simple device, with limited parts, easy to adjust or repair. In most cases, this can be done without removing or replacing the complete unit. The GROVER® PRODUCT LINE consists of two basic styles. There is the Adjustable model and the Non-Adjustable model. These can be differentiated by the mounting of the bell to the sound unit (as shown below). The Adjustable models are all part numbers beginning with 10 in the four digit part number. The Non-Adjustable models start with either 16, 17, or 20 in the four digit part number. All GROVER® air horns are designed to operate at a minimum air pressure of 60 PSI and are factory tested at this air pressure. Another component of our air horns would be the air volume, as this is especially important in the 10 series dual-mounted installation. Air volume refers to the ability to pass enough air through a given line size. With dual 10’s, a line size of at least ⁵⁄₁₆” is required from the tank to valve. From there, a “T” ½” tube is OK. Kit #1107 with Tubing & “T” Fitting are recommended for large horns, but must be combined with any of our other Installation Kits. Complaint: Air horn does not blow or sounds weak. Assuming that the plumbing is correct, we will check for tuning. 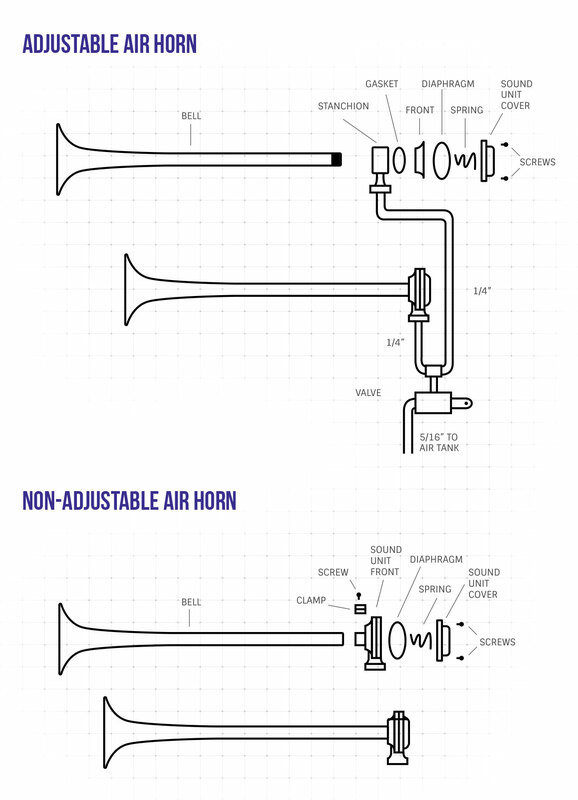 Tuning refers not to adjusting the horn to a high or low tune, but whether or not the horn is in tune or out of tune, blows weak, or lacks the intensity one would expect from an air horn (approx. 130db). Procedure: To tune a horn, the Adjustable models first need to check if the bushing threads that are exposed forward of the sound unit show one or two (in most cases). When tuning, hold bell end with left hand and grasp the complete sound unit with the right hand. Rotate counter-clockwise slightly, only enough to turn bell in or out to expose the threads slightly forward of the sound unit. A good starting point to tune is when one thread is exposed. Then, tighten the bell up to the sound unit and test sound. If sound is not pronounced, loosen unit and move it slightly ⅛ turn in or out and retry until sound is bright and crisp. In some cases, it becomes necessary to replace the Spring, Diaphragm, or Gasket. Use Kit #1094. On the Non-Adjustable models, use Repair Kit #1681 for the 1600 Truktone™ & 1700 Trombone™ series Single Horns and Kit #1607 for the 1600 Truktone™ series Dual Connected Horns. The only additional item that needs to be checked on these models is the bell seating into the sound unit and the tightness of the clamp. For Stuttertone® Emergency Air Horns, use Kit #1522. WARNING: Safety message to installers and operators of Grover Air Horns. Sound Hazards: Your hearing and the hearing of others, in or close to your vehicle, could be damaged by loud sounds. For hearing conservation guidance, refer to Federal, State, or Local recommendations. OSHA Standard 1910.95 offers guidance on “Permissible Noise Exposure”. All effective air horns produce loud sounds (120db and above) that may cause permanent hearing loss. Always minimize your exposure to horn sounds and wear hearing protection. Do not sound the horn indoors or in enclosed areas where you and others will be exposed to the sound.